Get rapid access to treatment from our expert physiotherapists at Nuffield Health Ilford Fitness & Wellbeing Gym. Appointments are available within 48 hours and you can now book online! Physiotherapy in Ilford - how can it help me? Physiotherapy can be used to help manage a wide variety of conditions that affect many of the body's systems. Most often these conditions relate to problems with bones, nerves, joints and soft tissues. A few common examples of these are painful backs, necks and joints, sports injuries, injury resulting from accidents or rehabilitation after surgery or strokes. Physiotherapists at Nuffield Health Ilford Fitness & Wellbeing Gym use a wide range of techniques such as manual therapy and exercise prescription to maintain health for people of all ages, helping patients to manage pain and prevent disease. To book an appointment please call 08450454845. We are also approved by, and work with most major private medical insurers. 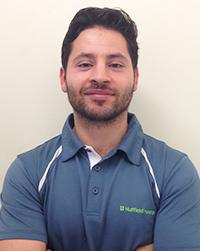 David's career as a health professional began in 2007 when he qualified as a personal trainer and later earned his Physiotherapy degree from the University of Nottingham. He has since gained a wealth of experience working in a private clinic in Mayfair and Hampstead treating a wide range of conditions, and he also worked with professional athletes from premiership football players to world class triathletes. David combines his knowledge of fitness, human movement, anatomy, and years of experience to drive others to reach their health goals.